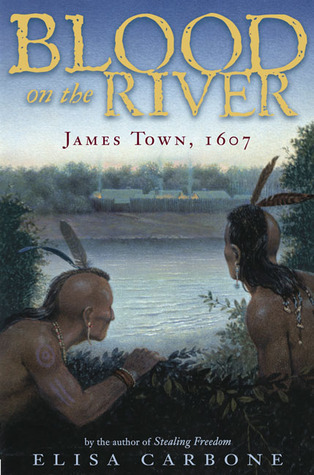 As the title states, Blood on the River is set in James Town, beginning in 1607. Samuel Collier, an orphan, is apprenticed to John Smith, with whom he will journey across the ocean to the new world. Smith and other members of the Virginia Company hope to quickly settle Virginia and then scour the land for the gold they hope will make them rich. While the gentlemen of the Company are convinced this will be an easy task which should require no sacrifices on their part, Smith tries to warn the new settlers of the dangers that lie ahead. Over the next two years, Samuel sees many of Smith's warnings come to fruition, as well as many other unexpected joys and hardships. The most remarkable feature of this book is its historical accuracy. Elisa Carbone has told a story entirely populated by real people, and she has meticulously researched each person's writings and experiences in order to provide as authentic a portrayal as possible. Instead of telling her own story set in a real time and place, Carbone chooses to tell the true story, and to bring history to life through her straightforward, yet engaging, storytelling style. Quotations from real historical documents contribute to the book's authenticity and remind the reader with every new chapter that this is the true history of our country. Even in situations where Carbone has to choose between two historical theories, she explains her decision and its implications for the rest of her story in her author's note. It would almost be possible to use this book in place of a textbook, so careful is Carbone with the details she includes. In addition to all the politics of the Virginia Company, this book also does a wonderful job of introducing the reader to day-to-day living in a new American settlement. In a world where so much of our work is done by machines and gadgets, this book will really open kids' eyes to how difficult it was just to survive in this country when it was new. Because Samuel is himself a child who has never experienced many of these things before, he is the perfect link between the reader and the unfamiliar world. I also appreciate that Carbone chose a character who was not present in James Town during its final winter. She manages to work in the fate of James Town without having to kill off the main character, which strikes just the right balance between a little bit dark - which this book is - and very depressing - which it decidedly is not. Also handled well is John Smith's relationship with Pocahontas, and with other native people. There is not a hint of Disneyfied romance in this telling of the tale. Instead, Smith treats the young Pocahontas as his child and works his hardest to respect the culture of her people, and of other neighboring Indian tribes. Even more than Samuel, the protagonist, Smith emerges as the most interesting character in this book because of his willingness to get to know the Indians and their customs without inflicting violence upon them. The consequences when others do not follow Smith's approach speak volumes about how right his ways really are. I recommend this book very highly to kids in grades 4 to 8, and to adults, too, whose education about American history might be missing some key facts. I also really think every school library needs to own this book. I would have appreciated my middle school American history classes much more if I'd had a book like this to help me understand things on a personal level.